Pio Rahner (*1982 born in Offenburg, lives and works in Bremen) studied photography at the Folkwang University of the Arts in Essen. Photography constitutes an essential part of his work; however Rahner also works in the area of sculpture. Pio Rahner’s works oscillate between conceptual photography and installation-sculpture. One of the main focuses of his artistic work is on the one hand the concentration on the specific object and on the other hand in the realisation/production and the positioning of the object in its surroundings. In this context, Pio Rahner in part treats found utilitarian objects and other finds as encyclopaedic objects, whereas his sculptural installations in contrast often fulfill a real purpose of use and are thus transformed again into an artificially created utilitarian object. Regardless of the medium, his works evolve out of an ambivalent relationship between area, surface and volume. “I have already in the course of my last work focused on standardised objects of everyday life. I am interested in the relationship between the human being and thing or object. When does a norm serve the human being, and when does a human being (inevitably) subject himself/herself to a norm? In the course of my stay in Burkina Faso, I will continue to develop my work further in the broadest sense, in the Operndorf Afrika and the neighbouring Ziniaré. Order systems and forms of storage are the focus of my study in Burkina Faso. As usual, I am going to approach work on this question, as a photographically and sculpturally, open-ended result process. Nomwindé Vivien SAWADOGO, (*1981 born in Dapoya/Ouagadougou) is a young photographer from Burkina Faso. He already at a very early age became enthusiastic about the medium of photography, which he himself describes as a “medium of testimony”. His research leads him to the complex of topics of the ethnic past and to the aesthetically and sociologically connoted traditional practices, which can be viewed as being in parallel to the tattoos and piercings that are today the focus of attention among the younger generations. With a respectful gaze he takes up motifs of destroyed cultural sites, landscapes and crumbling monuments and portrays ‘common people’, as smiths or miners – motifs, who in most cases remain unknown to the general public. He to this end wants to present a dignified testimony and his agreement with his own history. Vivien Sawadogo is moreover also the chairman of the ‘l’Association Burkina Imagerie’. 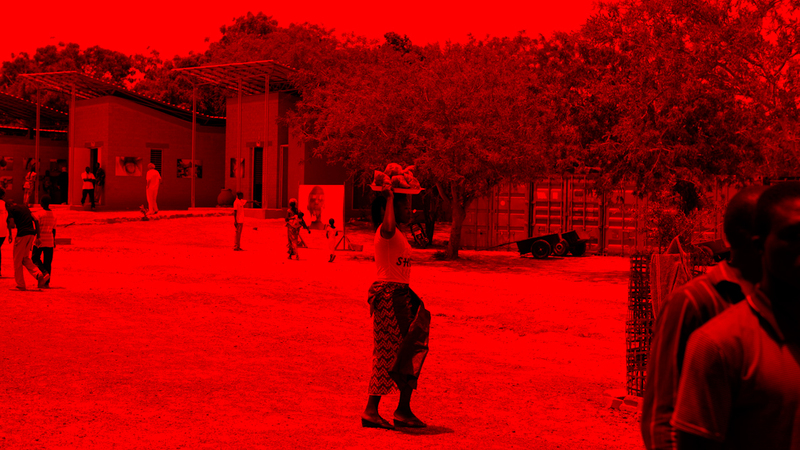 “In my opinion, the stay at the opera village constitutes an artistic journey, in which I will analogously to the work on the questions that drive me in my art, also want to produce realistic photographs: I am concerned about a realistic picture of and about Africa, which portrays a contemporary image of Africa, in contrast to the handed-down motifs of war and misery, or of long sandy beaches and Sahara romanticism. The Artist-in-Residence of the year 2016 was realised with the kind support of the Bremen Art Satellite/Artist’s house Bremen and funded by the Senator for Culture of the Free Hanseatic City of Bremen, the Goethe-Institute Ouagadougou, the German Factoring Bank Bremen and through private donations.